I have been listening to recordings of the Dana Waranara Convergence, held late last year at Brisbane’s Judith Wright Centre. I am very fortunate to be afforded the luxury of adequate time and distance to revisit this crucial event with fresh ears because I was not an outsider able to assess the experience from an objective perspective. Instead I was participating with all the passion and personal investment that makes one prone to bias. Initially my personal professional ambition and an impatience for a more substantial presence for Indigenous dance on the Western mainstage as a whole, caused me to momentarily lose sight of the rare opportunity this event afforded us. Monica Stevens, Chair of BlakDance, delivers her second opening address in two days. She differentiates the forthcoming Dana Waranara proceedings from those of the previous day. 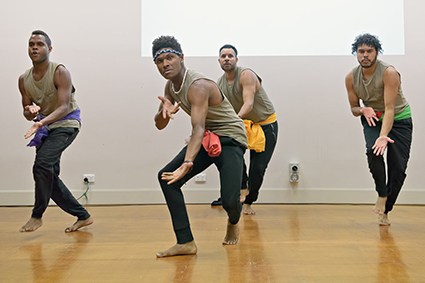 The BlakDance Summit’s purpose was to identify opportunities for growth and the current challenges hindering the prosperity of the Indigenous dance sector, with which to make a compelling case for a Blakdance forum in 2016. 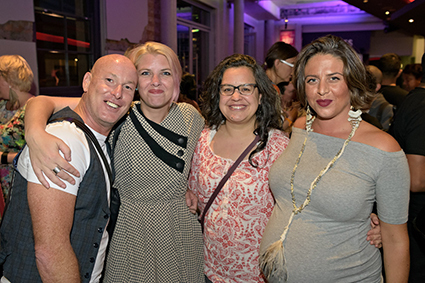 The main objective of Dana Waranarana was to initiate network relationships between presenters, producers and artists by providing a space to unpack what it means to be an Indigenous dance artist in a national and international context and to find ways in which partnerships might be forged. Monica’s oratory was impassioned and articulate; she talked business while never losing connection with her heritage, peppering her speech with personal anecdotes and accompanying photos referencing her homelands, thus integrating her cutural knowledge. She was both awe-inspiring and self-effacing with a ready wit and sense of humour that was to inform the event. Monica’s candour demonstrated how she meant for us move forward when time is of the essence, both urgent and immediate and yet simultaneously timeless; time honoured, timely. Ian outlined a contemporary dance history and its key players, some of whom were in the room. This resulted in a gentle prompting by the pioneers when details grew fuzzy or were erroneous. As many alumni of NAISDA (the institution which grew out of the initial Redfern Black Theatre workshops) were present, we were already privy to much of the information Ian had compiled, but Carole Johnson, founder of NAISDA Dance College and Bangarra Dance Theatre, added rare insight into her motivation for initially working in the Aboriginal community. Carole originally had no intention of remaining in Australia after her tour as performer with outspoken Colombian-American Human Rights protester and choreographer Eleo Pomare. But she was alerted to the injustices experienced by Aboriginal people through the televised footage of the 1972 Aboriginal Tent Embassy, where she would later perform. She decided to stay on after learning that Aboriginal people weren’t legally considered a people. For Carole this was reminiscent of the counting of slaves as three-fifths of a person for tax purposes between the northern and southern states of America in an early version of its constitution. But that’s just it. Australian Indigenous dance is not merely a product; it cannot and should not be reduced solely to a commodity. Indigenous dance is primarily a demonstrative communication of relationships with ancestors, with the environment and with community. As a provocation, I vehemently maintained that I don’t consider my audience at all. This, of course, is not true. In hindsight, what I meant was that in creating work I have a cultural imperative and all other considerations are secondary. I negotiate my performative/artistic delivery based on my prospective audience. This is no easy task. The Dana Waranara Convergence provided an opportunity for presenters and producers to gain insight into this complex performative plurality whereby an art product is also evidence of fundamental anthropological function. Maori artist Jack Gray proposed presenting venues see themselves as hosts, thereby engaging with their ‘talent’ in a way that encompasses more than the economic, encouraging reciprocity in lieu of standard power dynamics. Dana Waranara was an event punching above its weight on so many levels. It practically aimed to tackle life, the universe and everything in between….and very nearly pulled it off. There was so much said that the word count for this article couldn’t possibly accommodate. Dana Waranara needs to be a recurring event.